This Cresta Ridge new build has a modern, clean sensibility. It is a beautifully built home with the greatest attention to detail with each element selected to enhance the balanced, calm feel of the home. 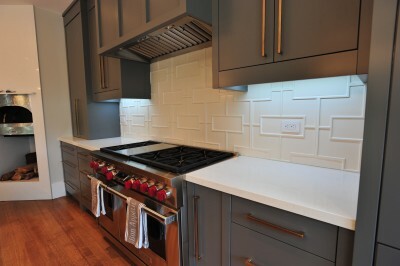 The kitchen features custom cabinets designed by PCD and crafted by Perfection Millwork, an Italian wood burning oven and an extensive walnut island. The tall wall cabinets house a thirty-six inch integrated Subzero fridge and a thirty- six-inch freezer. The Subzero fridge-freezer balance the wood burning oven and pantry which punctuates the end wall. 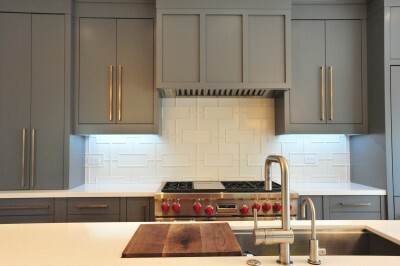 The cabinet doors are lacquered in grey offset by bronze cabinet hardware. The hood fan and crown detail reflect the clean, calm feel of the home. 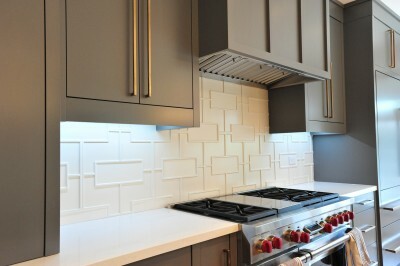 Off-white, geometric tile sits beautifully above the Wolf range. The twelve-foot island is built in walnut housing a forty-eight inch, under-mount stainless sink and features a Caesarstone countertop with a waterfall feature punctuating the ends. Custom walnut bar stools are upholstered in textured, metallic faux leather for easy cleaning. 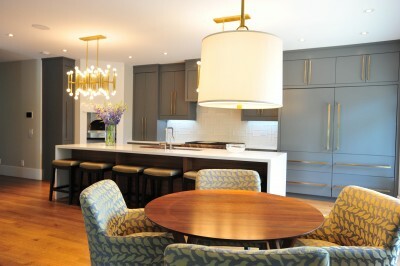 Custom, eat-in kitchen chairs feature a durable, geometric bird fabric for easy family dining. The modern, round table is walnut with a design nod to Mid Century Modern. 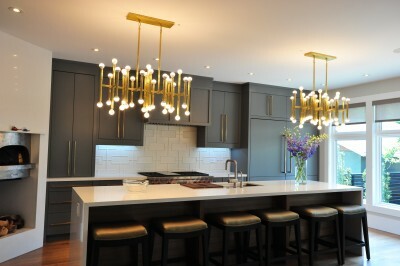 A large linen shade collaborates with the spectacular bronze chandeliers that hang over the island to finish the room.